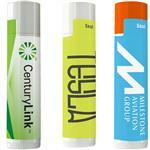 USA Made custom lip balm bargain priced lip balm products with your custom logo in a Chapstick style retractable dispenser. These protective, uniquely portable Lip Balms will never leave your sight. SPF15 means your lips and your customers will stay safe. FREE 48 HOUR RUSH PRODUCTION - too many choices ? 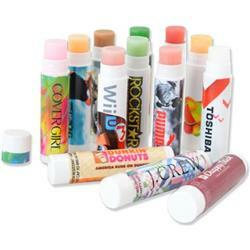 Need to see more custom lip balm? Call our helpful staff at 888-332-ADCO - we've sampled them all and know our product - and we're nice too! Available Colors: Tube starts as white. Caps are white. Production Times Available: 5-10 working days, 3 day rush available for spot color imprint (inquire for price). Dimensions: 5/8" W x 2 5/8" H.
Typical Imprint Area(s): 1 1/2" W x 1" H.
Available Imprint Options: Four color process (full color). Reference your requested PMS colors and we will match as close as possible. Each flavor change there will be an additional set-up charge. Minimum of 250 pcs per flavor.